Another great article from Stratfor. 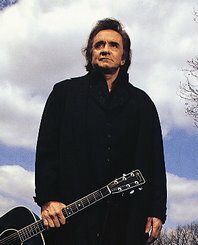 I have stated before that America's problem with its southern border is our problem as well. Cocaine made in the jungles of Columbia can reach Canadian cities in a matter of days. Yikes! Thankfully there are cops out there willing to put their lives on the line so as to keep us safe. Let's keep them in our prayers. Canadian police conducted several simultaneous raids on suspected drug traffickers in Newfoundland and Quebec provinces Oct. 11, arresting two dozen people and seizing marijuana, cocaine, weapons, cash and property. The drug-trafficking ring, which Canadian authorities believe was operated by the Quebec-based Hell's Angels motorcycle/crime gang, could have smuggled the cocaine into Canada from South America via Mexico and the United States. More than 70 members of the Royal Newfoundland Constabulary and Quebec's Provincial Biker Enforcement Unit carried out the raids, which represented the culmination of an 18-monthlong investigation dubbed Operation Roadrunner. The arrests were made near St. John's in Newfoundland and near the towns of Laval and La Tuque in Quebec. In Newfoundland, authorities seized $300,000 in cash, 51 pounds of marijuana and 19 pounds of cocaine, as well as vehicles, weapons and computers. In Quebec, $170,000 and four houses were seized. The marijuana seized in the raids could have been cultivated in Canada itself, in Mexico or the United States. However, most of the cocaine consumed in North America originates in South America, mainly in Colombia, where the Revolutionary Armed Forces of Colombia guerrilla group -- among other organizations -- traffics in drugs in order to finance itself. Bolivia and Peru are other sources of South American cocaine. Although much of the cocaine seized in Canada is transported from South America via Jamaica and Haiti, a good portion also comes through Mexico and the United States -- demonstrating that the problems associated with Mexico's drug cartels and the porous U.S.-Mexican border affect Canada as well as the United States. Approximately 25 percent of the seized cocaine destined for Canadian markets either transits or is intended to transit the United States, according to a 2004 Canada-U.S. Border Drug Threat Assessment. 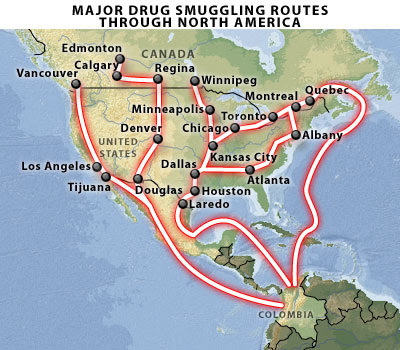 In order to use the Mexican-U.S. route, producers in South America deliver the cocaine to a Mexican drug-trafficking organization, which then transports it over its network to points on the U.S.-Mexican border known as plazas. The plazas stretching from the Gulf of Mexico to roughly Arizona are controlled by the Gulf cartel, while the plazas in Arizona are dominated by a group of cartels based out of the Mexican state of Sinaloa. Drug trafficking around Tijuana is largely controlled by the Arellano-Felix organization. From these plazas, the cocaine enters the United States and is moved north via the Interstate highway system to distribution points in the United States, most often major cities along the Interstate, such as Houston and Los Angeles. From these points, the drugs are further distributed to other criminal/militant groups, shipped to the Canadian border and turned over to Quebec's Hell's Angels or other drug-trafficking organizations. The links between criminal/militant gangs from South America to Canada and the ease of smuggling drugs across the U.S.-Mexican border are of concern to Canadian intelligence and law enforcement for another reason as well. They also see this vast network as a way for militants to enter Canada. 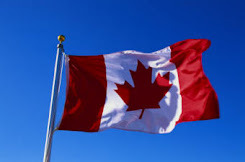 Once inside the United States, they note, it is relatively easy to get into Canada over the same smuggling routes that are used to move contraband such as drugs, cigarettes and stolen cargo -- despite Canada's own ambitious efforts to control its borders. Although the flow of militants traditionally has been more of a problem for the United States, the arrest in 1993 of five Jamaat al-Fuqra operatives at the border at Niagara Falls underscores this concern. They allegedly were planning to conduct attacks in Toronto. The jungles of South America, where cocaine is produced, seem a long way from the St. Lawrence River. Using a sophisticated shipment and distribution network, however, criminal and militant organizations can cover the distance in a few days.